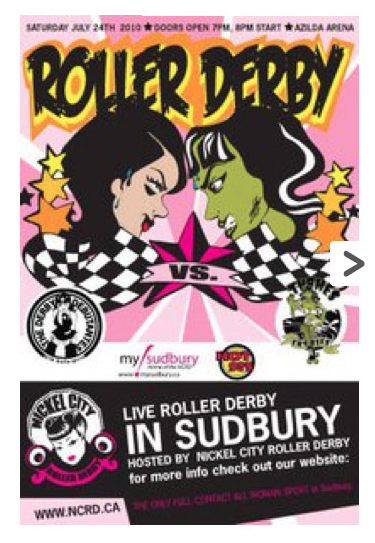 This weekend Sister Slag the travelling contingent from Sudbury comes all the way down representing Nickel City Roller Derby at The Hangar in Toronto to square off against Toronto Roller Derby’s newest squad of D-VAS. 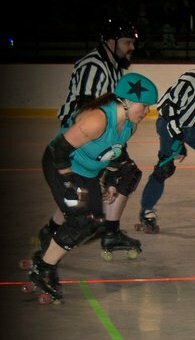 It’s not the first time members of Nickel City have been to The Hangar, having driven all the way down to see the ToRD playoffs in 2010 or fully participated in Blood & Thunder Bootcamp and one member #99 Low Ride Her picked as jammer for Black Mamba! There must be something in the water up there in the Nickel City. 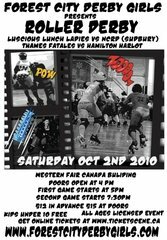 Just last summer on July 24 teams from GTA Rollergirls in the guise of the Derby Debutantes took part in an exhibition bout against Thames Fatales in Sudbury’s Dr. Edgar Leclair Community Centre/Arena in Azilda to showcase the sport of Derby before what seemed to be a crowd of 600 energized by the display of brutalbeauty. GTAR remembers whatever memorabilia they brought being quickly sold out.